Center for REALTOR® Development Canada - Seniors Real Estate Specialist (SRES®) Designation Course: Canadian Edition. 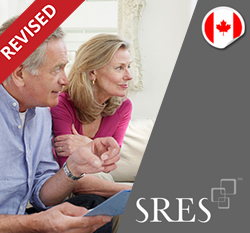 Now In: → Seniors Real Estate Specialist (SRES®) Designation Course: Canadian Edition. Seniors Real Estate Specialist (SRES®) Designation Course: Canadian Edition. In Canada, Baby Boomers and Retirees represent nearly half of the population. For Canada's adults aged 50+, the homes that they live in are their largest asset and account for most of their net worth. As buyers and sellers, these consumers have very distinct real estate goals, concerns, and requirements. Completion of the Seniors Real Estate Specialist (SRES®) Designation Course: Canadian Edition is an essential step for real estate professionals in learning the 50+ market and for understanding the needs of these real estate consumers. This course looks at the following: housing options, from active-adult communities to aging in place to assisted living; marketing strategies and counselling tips; finance, tax, and estate planning considerations; and developing a team of experts and service providers. This course also addresses the personal aspects of working with senior clients and needed sensitivities on the part of real estate professionals. Please note that the first year of membership ($99 USD) with the SRES Council is free to students who enroll in and complete this course.